Last week I shared the bear cave craft and alphabet activities we did for our forest theme. We also used the bear cave for a couple of math activities. We started with our bear cave, a number cube, and small bears. We had some gummy bears, so we used those. You could also use small bear figures or teddy grahams. The kids rolled the number cube and counted how many dots. Then they placed that number of bears into the cave. They continued rolling, counting and adding until they didn’t have any bears left on the plate. They were still very engaged in the game by this point. Instead of ending the game they rolled the cube, counted, and removed that many bears from the cave. To include some math vocabulary, I gently introduced the concepts of adding, taking away, more, and less. This game could be modified many ways to increase the level of difficulty. One idea would be to start with 10 bears in the cave. Roll the cube and remove that many bears. Then the child could identify the difference between the two numbers by counting how many bears are left inside the cave. Tinker was intrigued by what the big kids were doing so I gave her a bowl of gummy bears and an egg tray. 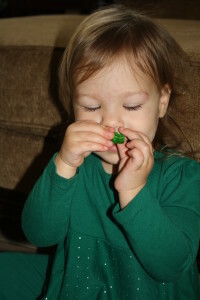 She immediately noticed that the gummy bears smell good, so she spent a bit of time picking them up and smelling them. 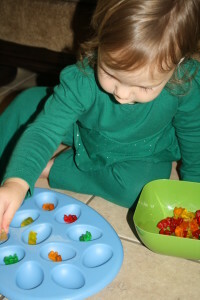 As kids are ready you could also create patterns with the gummy bears. The story we read to go along with these activities was Hibernation Station. We enjoyed the rhyming text and the chance to discuss the different animals who live in the forest. To incorporate a little math, we reread the story a second time to count how many animals were on the train. Have you done any math activities related to bears? We had her roll the dice to hop in the cave to get safe from the coming rainstorm. Then (maraca shakes) the storm is here! Eat the food in the cave. Next, “yay the storm is over and the bears can come out to play!” Roll the dice. “how many cubs cleaned their face and and can come play?” How many still need to clean up? What an awesome adaptation. I love it, Ginny! Did this in accordance with our Letter of the Week lessons we did for letter B, Bears. Just played this with my 4 yr old daughter and practiced addition by rolling the dice and having them go into their cave, then subtraction by having the cubs get hungry and the adult bears roll the dice to see how many were going to go get food (review what bears eat) and then counting how many were left in the cave when the gatherers left. Then “oh no” a storm is coming they better hurry back! !” how many bears brought back food! (roll the dice) and then the storm is here (shake maraca over cave) and have them enjoy their food. Once the storm is over, how many get to come out of the cave and play. Fun, thanks for the idea!. I play a Bear Math game in grade 1. -You choose a number and kids work with a partner. If the number is 8, then they get 8 bears ( or counters). – 1 child closes his eyes, while the other hides some bears in the cave. I use (inverted)margarine containers for caves. So some are under the container ( hidden) & the others are placed on top of the container. The partner says how many are showing AND how many are hidden. The AND represents “plus” for addition. After playing orally, you can then go to written. It’s a good one to practice vertical equations. I make a sheet with inverted container. Child writes 6 on top, + sign beside cave drawn on sheet, and 2 underneath. Sorry, I don’t have a sample here. Kids love playing this. Stay on one number per session so they get repetition with number facts for that number. Thanks so much for sharing, Sharon. It sounds like a great game. This is SO cute! 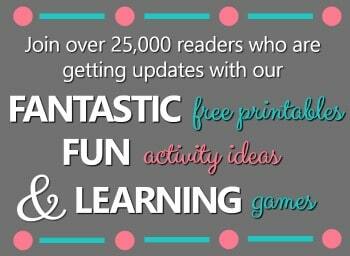 Thanks for linking up to Share It Saturday~ I’ll be featuring your idea this week. Thanks so much, Karyn! I really appreciate the feature. 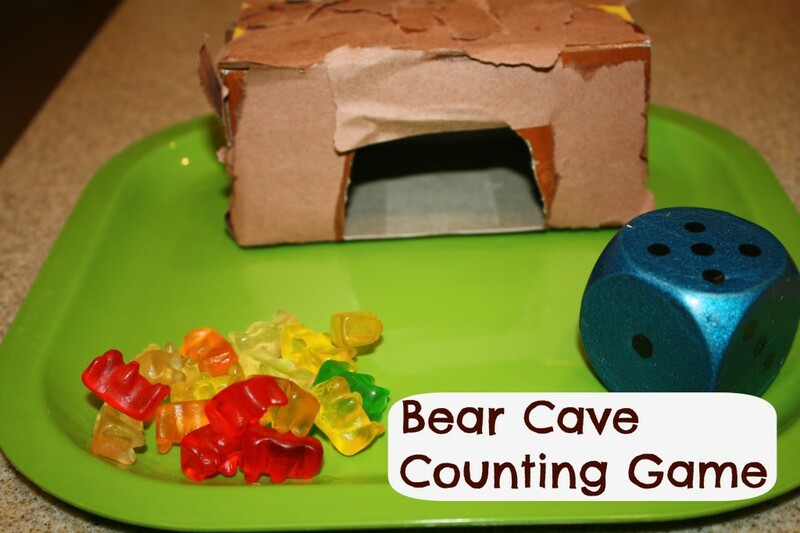 I love how your addition of the bear cave makes an ordinary (boring) math activity become a real adventure! Will probably do this with my grandkids! Thanks for a cute idea! Thanks! I hope your grandkids have fun with it! 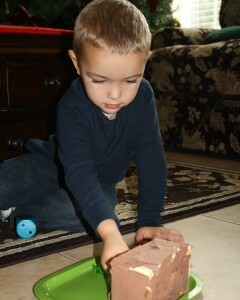 There is also an ABC game that we did to go along with the bear cave. Check it out if you missed it…lots of growling bear fun! 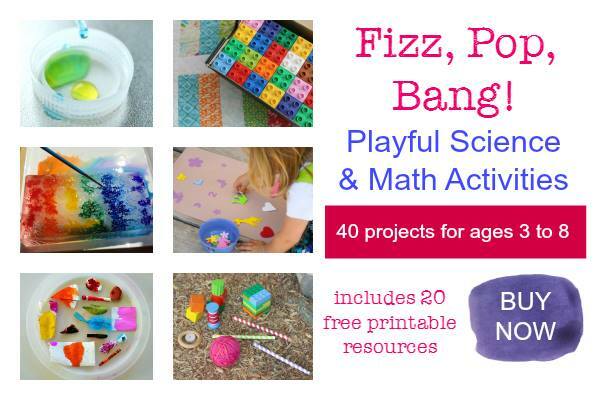 I absolutely love this activity – and how you let it evolve and vary based on the child, their age, interest and need. I think we will definitely be doing this! Thanks! As a kindergarten teacher I learned a lot about varying activities based on the abilities and interests of the kids. There is such a difference even among kids of the same age. Now at home I am learning how to vary the activities even more for my 4 littles who will be ages 1, 2, 3, and 4 (after next weekend’s birthday!). Hope you guys enjoy doing the activity! 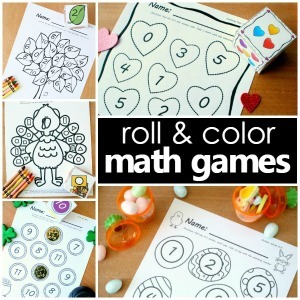 Super cute math activities! We just yesterday, got a book from the library Teddy Bear Counting by Barbara Barbieri McGrath. Great bear math book! Thanks for sharing on the Share It Saturday linky! I’ve seen Teddy Bear Patterns, but not Teddy Bear Counting. I’ll have to check it out. Thanks!